Notions of which behaviours comprised sin, and what actions might lead to salvation, sat at the heart of Christian belief and practice in early modern England, but both of these vitally important concepts were fundamentally reconfigured by the reformation. Remarkably little work has been undertaken exploring the ways in which these essential ideas were transformed by the religious changes of the sixteenth-century. In the field of reformation studies, revisionist scholarship has underlined the vitality of late-medieval English Christianity and the degree to which people remained committed to the practices of the Catholic Church up to the eve of the reformation, including those dealing with the mortification of sin and the promise of salvation. Such popular commitment to late-medieval lay piety has in turn raised questions about how the reformation itself was able to take root. Whilst post-revisionist scholars have explored a wide range of religious beliefs and practices - such as death, providence, angels, and music - there has been a surprising lack of engagement with the two central religious preoccupations of the vast majority of people. To address this omission, this collection focusses upon the history and theology of sin and salvation in reformation and post-reformation England. Exploring their complex social and cultural constructions, it underlines how sin and salvation were not only great religious constants, but also constantly evolving in order to survive in the rapidly transforming religious landscape of the reformation. Drawing upon a range of disciplinary perspectives - historical, theological, literary, and material/art-historical - to both reveal and explain the complexity of the concepts of sin and salvation, the volume further illuminates a subject central to the nature and success of the Reformation itself. Divided into four sections, Part I explores reformers’ attempts to define and re-define the theological concepts of sin and salvation, while Part II looks at some of the ways in which sin and salvation were contested: through confessional conflict, polemic, poetry and martyrology. Part III focuses on the practical attempts of English divines to reform sin with respect to key religious practices, while Part IV explores the significance of sin and salvation in the lived experience of both clergy and laity. Evenly balancing contributions by established academics in the field with cutting-edge contributions from junior researchers, this collection breaks new ground, in what one historian of the period has referred to as the ‘social history of theology’. "This is an excellent collection, sharpened by Alexandra Walsham's afterword. (…) It is a very good book. Few collections of articles have this many contributors that are so enlightening." 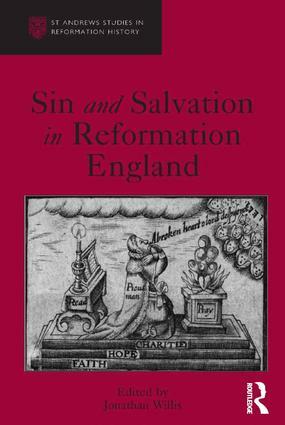 Introduction: sin and salvation in Reformation England, Jonathan Willis. Part I Defining Sin and Salvation: Sin and salvation in William Tyndale's theology, Ralph S. Werrell; ‘Appareled in Christ’: union with Christ in the soteriology of John Jewel, André A. Gazal; Separating the universal bishop from the universal Church in the Jewel-Harding controversy, Angela Ranson; ‘Moral arithmetic’ or creative accounting? (Re-)defining sin through the Ten Commandments, Jonathan Willis. Part II Contesting Sin and Salvation:Sin and salvation in Roger Ascham's Apologia pro Caena Dominica, Lucy Nicholas; Sin, salvation, and female sexuality in John Foxe’s ‘Book of Martyrs’, Margarita Leonti; ‘[A] solemne league and contract with the Devill’: narratives of sin and desire in A true and exact relation (1645), Sheilagh Ilona O'Brien. Part III Reforming Sin and Salvation: Salvatrix Mundi? Rejecting the redemptive role of the Virgin Mary, Stephen Bates; Disputed words and disputed meanings: the reformation of baptism, infant limbo and child salvation in early modern England, Anna French; ‘If it were made for man, ‘twas made for me’: generic damnation and rhetorical salvation in Reformation preaching and plays, Maria Devlin; Preparationism in Lucy Hutchinson’s ‘Principles of the Christian Religion’, Elizabeth Clarke. Part IV Living with Sin and Salvation:Sin and salvation in the sermons of Edwin Sandys: ‘Be this sin against the Lord far from me, that I should cease to pray for you’, Sarah Bastow; Seeing salvation in the domestic hearth in post-Reformation England, Tara Hamling; ‘Have a little book in thy conscience, and write therein’: writing the Puritan conscience, 1600-1650, Robert Warren Daniel. Afterword, Alexandra Walsham; Index. Dr Jonathan Willis is a historian of the English Reformation, with an interest in the history and theology of late-medieval and early modern Europe more broadly. His research focuses on the religious and cultural history of England over the course of the long-sixteenth-century, and his publications include: ’The Decalogue, Patriarchy, and Domestic Religious Education in Reformation England’, in J. Doran and C. Methuen (eds), The Church and the Household (Boydell, forthcoming); ’Repurposing the Decalogue in Reformation England’, in D. Markl (ed. ), The Influence of the Decalogue (Sheffield Phoenix Press, forthcoming); ’Protestant Worship and the Discourse of Music in Reformation England’, in N. Mears and A. Ryrie (eds),Worship and the Parish Church in Early Modern Britain (Ashgate, 2013); 'A Pottle of Ayle on Whyt Sonday': Everyday Objects and the Musical Culture of the Post-Reformation Parish Church’, T. Hamling and C. Richardson (eds), Everyday Objects (Ashgate, 2010); and Church Music and Protestantism in Post-Reformation England: Discourses, Sites and Identities (Ashgate, 2010).